The AT&T Office@Hand Mobile App allows you to initiate conference calls, with its ability to send email or SMS invitations directly from the mobile app. Hosts and Participants may join the conference by tapping the link on the invite. When enabled, Participants may join the conference before the Host logs in. To use Conferencing, tap the Kebab icon (Vertical Ellipsis), and then tap Conferencing. From here you can take note of the Dial-in number, Host access and the Participant access codes. Dial-In Number – The number that the Host and the Participants dial to connect to the conference bridge. 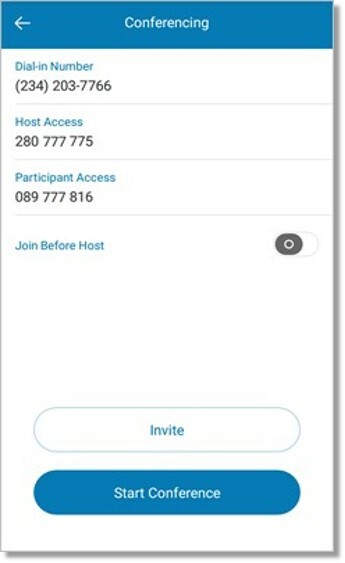 Host Access – The number that the host dials after entering the Dial-In number to be able to log into the conference. Participant Access – The number that the Participants dial to be able to connect to the conference. There can be up to 999 Participants connected to a conference, depending on the Internet connection. Join Before Host – The Host can opt to allow Participants to join the conference even when the Host has not yet logged in. Toggle the button to enable or disable this feature. Invite with Text allows the host to send invites to Participants via SMS. Participants may join the conference by tapping the link to the conference. Invite with Email allows the host to invite Participants via Email. Participants may join the conference by clicking a link to the conference. See Inviting Participants to a Conference Call to learn how to invite Participants to a Conference Call. Start Conference – Tap to initiate or start a conference call.